Base Chakra Gift Set – includes : 12ml Essential Oil, 50g Body Lotion, Crystal & Daily Affirmation, complete with Gift Bag. Relates to: security, finances, confidence & feelings of being ungrounded. 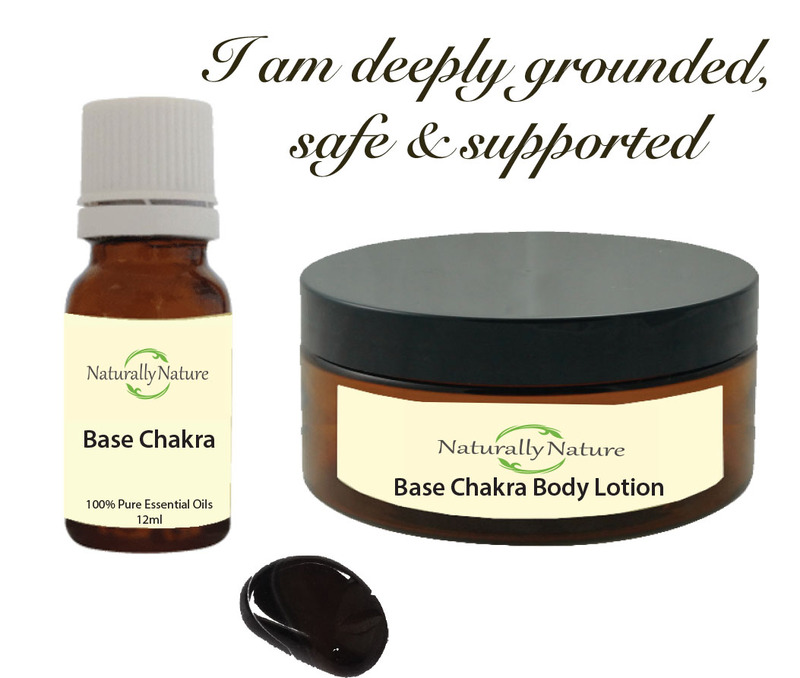 12ml Base Chakra Pure Essential Oil Blend, 50g Base Chakra Body Lotion, Daily Affirmation & Crystal to represent the Base Chakra complete with gift bag. Add 3-4 drops of Base chakra pure essential oil blend to an oil vaporiser or bath add four drops to every 10ml of carrier oil for adults. Purified aqua, vegetable glycerin, Isopropyl myristate , prunus amygdalis ( almond oil) cetearyl alcohol (coconut oil wax), glyceryl stearate (vegetable derived moisturiser) sodium stearate (vegetable derived emulsifier), sodium cetylphosphate (plant based food grade Ph regulator), guar hydroxypropytrimonium ( natural thickner derived from the guar tree) hydroxymethylglycinate (gentle preservative derived from vegetable glycine), essential oils of Lavender (Lavendula Officinalis), Cedarwood (Juniperus virginiana), Rosewood (Aniba rosaeaodora), Black pepper (Piper nigrum) & Frankincense (Bosewelia Carteri). Lavender (Lavendula Officinalis), Cedarwood (Juniperus virginiana), Rosewood (Aniba rosaeaodora), Black pepper (Piper nigrum) & Frankincense (Bosewelia Carteri).